I once read somewhere that if you find one recipe in a cookbook that you end up making time and again then the price of the book was justified. If that’s true, then On Top of Spaghetti was a bargain. Every pasta dish I’ve tried in this book is fantastic, and I will definitely make them many times. A couple of favorites have been Spaghetti with Roasted Asparagus “Pesto” and Spaghetti with Fresh Spinach and Gorgonzola. Most recently, I tried the Bucatini with Five Pepper Sauce topped with pecorino romano and was very happy to have done so. Each dish is a simple combination of excellent ingredients that delivers amazing flavor. Classic Italian restraint is evident throughout the book. The sauces require just a few items, some of the pasta boiling water, and some perfect cheese for topping. Both the Roasted Asparagus “Pesto” and the Five Pepper Sauce require a good amount of extra virgin olive oil which produces silky and nicely balanced sauces. These dishes have been excellent piping hot off the stove and just as divine as leftovers. The Five Pepper Sauce can be nudged in a spicier or milder direction depending on how you chop your chiles (with seeds and membranes or without). I made it a bit spicy which we loved, but for company I would go a little milder. 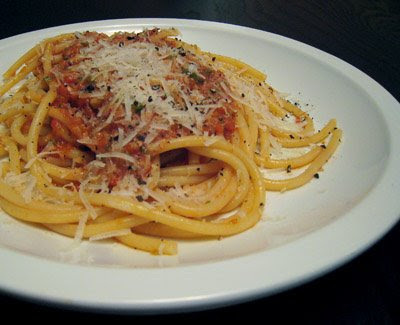 One interesting thing I learned from this dish is that Bucatini is a difficult pasta shape to twirl on your fork. Slurping is required as are napkins. 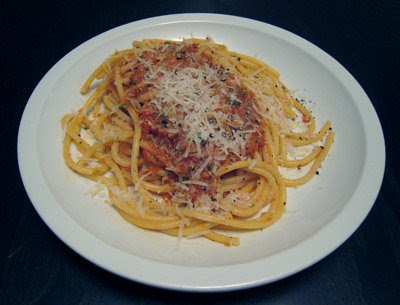 Kurt requested that next time we make this dish with linguine or spaghetti. I thought that if the sauce were left a bit chunkier a big rigatoni shape would be nice. Maybe we’ll eventually try all three. Hi there, this is Kathy, I'm just having a look around. I saw the pic of the bucatini on Photograzing and thought I'd say hello. No recipe? Maybe you could post it some time? I would love to try it.